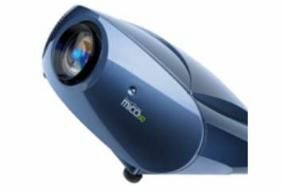 BRISTOL SHOW 2010: SIM2 to expand Mico range of LED projectors | What Hi-Fi? But the good news is that SIM2 is planning to expand the range, with more affordable models – the Mico 40 and Mico 20 – joining the range in September. There'll also be a new flagship model above the 50, the Mico 60. No UK prices have yet been confirmed. "Our plan is to launch another three LED projector models in 2010,"says SIM2. "We believe LED is absolutely suited to DLP projection." Also unveiled here at the show on the SIM2 stand is Screen Innovations' Black Diamond multi-layer projector screen, designed to reject ambient light. This means it can be used in rooms under nomal lighting conditions in the home. Two versions are available: one with 0.8 gain, the other with 1.4 gain. They both cost £3000. Currently the Black Diamond screens are fixed frame, but Screen Innovations is working on motorised versions.